The arrest of one of Russia’s best-connected billionaires on charges of fraud and embezzlement knocked shares in his companies lower and fueled speculation it could be the harbinger of a shake-up in the cabinet this spring. Tycoon was arrested Saturday along with his brother Magomed and jailed as he prepared to fly to the U.S. In court, he denied the charges but was ordered held without bail for two months. The unexpected legal troubles set off fears among investors that the Summa Group of which he’s a co-owner could be under threat. At the same time, political analysts said his jailing could mean problems for top officials thought to be close to him, in particular Prime Minister Dmitry Medvedev, who faces reappointment with the start of a new presidential term in May. Investors read the arrest as bad news for Summa’s companies, especially Far Eastern Shipping Co., which sank to a September low, dropping as much as 21 percent. Novorossiysk Commercial Sea Port PJSC had its biggest intraday loss since May. TransContainer PJSC and Novorossiysk Grain Plant PJSC retreated as much as 4.5 percent and 4.2 percent, respectively, before paring declines. The benchmark MOEX Russia Index was trading 0.9 percent higher as of 1:38 p.m. in Moscow. Summa had been in a long-running conflict with state-owned oil pipeline operator Transneft PJSC over control of Novorossiysk Commercial Sea Port. The Dagestani-born tycoon’s wealth surged during the years when Medvedev held the presidency, in part thanks to state contracts. Popov compared Magomedov’s arrest to that of billionaire Vladimir Evtushenkov, who spent three months under house arrest in 2014 on charges of money laundering during a probe of his acquisition of Bashneft PJSC, which was later taken over by the state-owned Rosneft PJSC. “It looks like a redistribution of property, but it’s unclear who stands behind this case and who wants Summa’s assets,” said Popov. Prosecutors denied any political motivation in the case and Kremlin spokesman Dmitry Peskov said any possible impact on cabinet appointments was speculation. 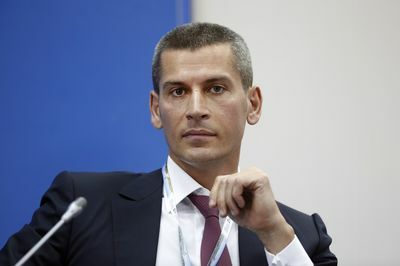 Evgeny Minchenko, a political consultant who often works for the Kremlin, said Magomedov was under pressure from other influential groups and that the arrest would likely benefit rivals, including Rosneft Chief Executive Officer Igor Sechin. But he said Medvedev might be able to ride out the storm, given that Vladimir Putin, who starts his fourth presidential term in May, is unlikely to want a strong figure in the prime minister post. Medvedev’s job prospects have benefited in the past from his apparent weakness, he said, “because if you’re weak, then you won’t try to become a rival power center” to the president, he said.